In an era where we watch stars self-destruct on too regular of a basis, the career of Marlon Brando can offer these people both lessons and hope. 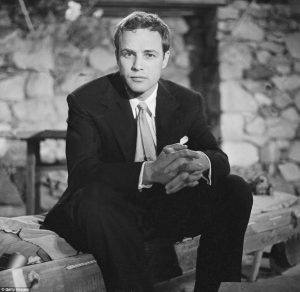 After bursting onto the scene in the 1950s (and our series focuses on four films released between 1952-1954), Brando’s personal life and career went off the track in the 1960s. He went ten years without making a successful film and it looked like his legacy would rest on his solid early work. Then came his second Academy Award for The Godfather in 1972 followed by another nomination for his work in the controversial Last Tango in Paris. My introduction to Brando was at the Holland Theatre (now the Knickerbocker) in 1979 when my oldest brother took me to see Apocalypse Now since he felt all 15-year-olds should see that film. It was a memorable experience as Brando slowly leans forward in the light, rubbing that bald head and mumbling. Little did I know that the mumbling was a Brando trademark. After his explosive performance in A Streetcar Named Desire, Brando was nicknamed “the mumbler” by some in Hollywood. His body language in the movie matches his speech, as he moves from slouch to taut, from mumble to rapid-fire shouting in a heartbeat. It was just his second movie appearance and he had played Stanley Kowalski in the Broadway version just prior to the movie. He understood his character and it is seen in nuances of the film. 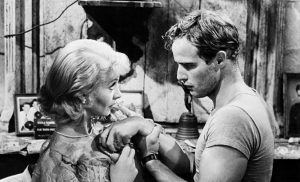 Brando is the perfect match for all the subtexts found in all of Tennessee Williams’ work because you can see the internal conflicts in his every gesture. 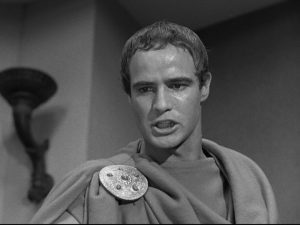 While Streetcar brought him fame, Brando wanted to show he could do more than just mumble so he took on the Mark Antony role in a film adaptation of Shakespeare’s Julius Caesar so he could show his acting skills up against the likes of John Gielgud, James Mason, Deborah Kerr, and Greer Garson. The critics agreed that he could more than hold his own, so he then went back to mumbling. He went from Julius Caesar to The Wild One where we get the iconic Brando on the motorcycle photo. The film has great lines and Lee Marvin is good, as always, but the motorcycle gang that orders cups of coffee appears a little dated. Still, it is Brando in rare form showing a man conflicted between emotions. The tough guy falling for the nice girl, a man who wants to be more than he is but is not sure how to get there. 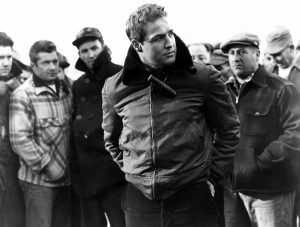 In our final film, On the Waterfront, Brando plays another tough guy struggling with where to go in life. If I was forced to choose a favorite film, this is easily my all-time favorite. Eva Marie Saint, who took home the Academy Award for her debut performance here, matches Brando’s intensity. Brando is the punk who could have been a great boxer (think “I coulda been a contender”) but takes a dive for his brother and his Mafia-like union group. Now he has the chance to do something right and you see the conflict in his face and body — he wants to better than he is but he lacks the courage. And then you have Karl Malden pulling off the role of a priest that is the anti-Bing Crosby version. He is pushed out from his safe church to bring Christ to the docks and his speech over the dead body of a dock worker in the belly of a ship may be the best sermon ever preached, on or off stage. The fact that his character is based on a real-life priest may have helped cement his character. The film was a huge success, winning eight Academy awards including Brando and Marie Saint for their acting, Eli Kazan for his directing, and the film itself won the best picture award.